If you’ve ever played the boardgame Risk, Conquist HD from Schmeuk Studios will feel incredibly familiar. The screen itself might look a little different from the board you’re used to, but after you’ve chosen between the US, Europe, Atholon or The World you’ll quickly settle into conquering the world or completing a secret mission (like taking over Africa) just like the golden days of little plastic pieces wielding canons and rifles. 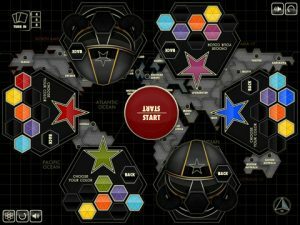 Once you sit down and choose a map, the game’s homescreen will give you the opportunity to pick your color and then lay out multiplayer opponents or set up computer bots for a total of three to six players. From there you set off toward taking over territories and deploying troops strategically. When the game starts the troops face each other in dice rolling battles of troop depletion and territorial takeovers. Between each turn you’re given additional troops that you can strategically distribute into each area that you want to protect, and then you set off into attacking territories again by clicking on the troops you want to send to an adjacent enemy territory. In other words, most of the time you spend playing will probably be spent in the fancy robotic dice screen that faces off two two colors with the attacking and defending territories listed along with overall troop numbers, the number of dice you choose to roll, etc. 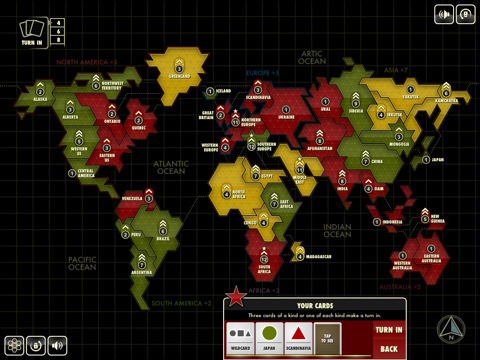 In playing I found that some people loved the Risk clone gameplay, but another Risk newbie just couldn’t jump on board. Yet another player felt that the electronic dice roll took away her lucky dice blows and the great feeling of actually rolling a winning number. Whatever the case, there’s no doubt Conquist is well executed. The graphics are clean, the gameplay is smooth, and there’s a different soundtrack for every map you choose. 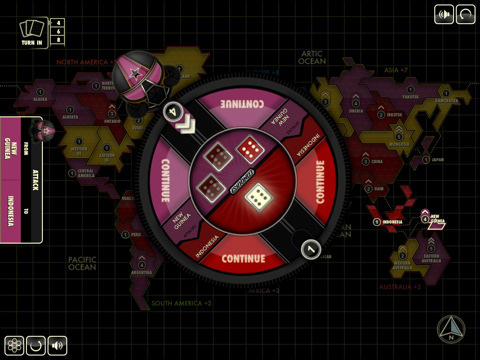 The sound effects add a sense of urgency to the entire game without distracting from your actual strategy, and a scrollable page that spells out all the rules is provided for newbies trying to get a handle of the game. All said and done, this game is much more fun in multiplayer. While there’s nothing wrong with the AI opponents per se, it’s sometimes difficult to tell who they’re attacking and what it is they’re doing. 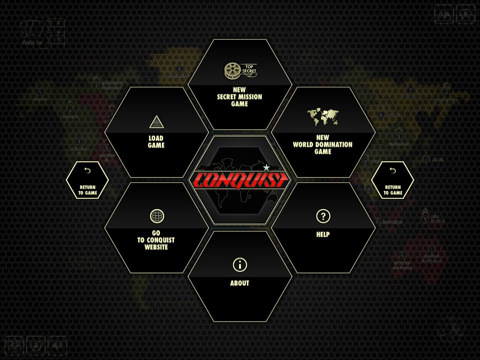 Also, when you conquer the world against robots all that shows up is an anticlimactic screen that says you’ve taken over the world (along with a link to the Conquist app website). If you actually gather a few legitimate Risk fans around your iPad though, it’s a completely different story. Not only do you get to show off the screen that rotates automatically for people sitting around a table (so you don’t have to pass the iPad), you also have the game board like experience on your person without having to hoist around an oversized cardboard box. And the sweet feeling of beating a few friends fair and square. That would beat a “You’ve taken over the world” text screen any day. 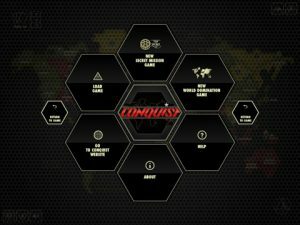 Bottom Line: Conquist is a faithful Risk reincarnate with great graphics, smooth gameplay, and a multiplayer interface that will beat the AI experience any day.